There's a new face on the speculative fiction magazine scene - and a welcome one it is too. 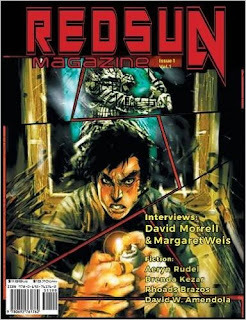 Red Sun magazine has recently launched its first issue, and aims to publish three times a year, bringing with it interviews with authors, in-depth book reviews by Ann Stolinsky, and a selection of fiction stories. The first issue frontloads its big names. The two big interviews are with David Morrell, best known as the creator of Rambo in his book First Blood, and Margaret Weis, familiar to many a Dungeons & Dragons fan for her work on the Dragonlance series and so much more. Both bring a disarming honesty to their conversations - Morrell talking about how family tragedy affected the course of his writing and providing a keen insight into his version of the character that became larger than life on the movie screen, while Weis shares a moment that makes your heart leap in your chest as she tells how at a book signing a veteran wanted her and co-writer Tracy Hickman to accept his Silver Star because a character from their books inspired him to save the lives of 12 men. The military side of things is particularly poignant as the magazine is particularly interested in featuring military-themed science fiction, especially written by veterans. Such is the spirit of the first story in this collection, The Orion Incident, by David W. Amendola, a gripping story of survivors exploring the hulk of an asteroid-smasher ship, and finding a dangerous and disturbing payload beyond the nuclear missiles they sought to secure. I really enjoyed this story - it reminded me a lot of Matthew Harvey's story Dead In Space, in the Tales From The Universe collection. Both capture that claustrophobia, that nervousness - even if they end up going to very different places in the end. Taste The New Drug, by Rhoads Brazos, has the feel of James Steakley's Vampire$ Inc fused with Greg Bear's Blood Music - as an expert team of hired killers run into a problem not so much too big for them to handle, as too small for them to deal with, as an insidious plague takes hold of the city in which they make their undignified living. This is my favourite story in the collection, although the one that follows it, Star Jelly, by Brenda Kezar, is a close second as it propels us into old school Twilight Zone style 1950s horror, with globs of goo falling from the sky and leaving two women fleeing in the face of the terrifying outcome that comes with it. Lastly, the collection is rounded out by a story by Aeryn Rudel, Paper Cut, about an origami samurai sent to kill a hitman. He features in the closing interview too, chatting amiably about his rejections, his dinosaur nerd nature, and more besides. A good value package at $3.99, Red Sun is a splendid addition to the market. More power to them! A free copy of Red Sun was provided to Altered Instinct in exchange for an honest review. Red Sun is available on Amazon here - and you can find out more on their website, http://redsunmagazine.com.